Sambhaji lost his mother Sai bai at the age of 2. After her death, his paternal grandmother Jijabai looked after him. Initially his stepmother, Soyarabai, also doted on him a lot. Sambhaji was a tiger cub in the true sense. He was extremely handsome and possessed immense bravery. He was a scholar of Sanskrit and eight other languages. In 1666, he was married to Yesu bai, and later the couple had a son – Shahu. On June 6th, 1674 at the time of the coronation of Shivaji Maharaj, he was declared the prince of the Sovereign Maratha Kingdom. Many visiting dignitaries at the coronation ceremony have written about his acumen, intelligence, personality and most important of all, his modesty. As a prince, Sambhaji proved his bravery and military brilliance on more than one occasion. 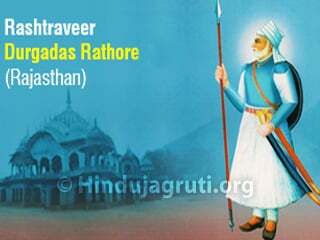 He led and won his first war at Ramnagar at the age of 16. During 1675-76 he led successful campaigns in Goa and Karnataka. The politics fuelled by the wife Soyarabai, of Shivaji Maharaj, with some other courtiers led to Sambhaji’s estrangement. For almost one year, Sambhaji left Shivaji’s kingdom and joined Aurangzeb’s commander, Diler Khan as part of politics. This came as a rude and extremely sad shock to Shivaji. This process caused further widening of the rift between Sambhaji on one side, and Soyarabai on the other. As a result, Sambhaji was not invited for Rajaram’s wedding and moreover he was not even informed of the sudden death of Chhatrapati Shivaji Maharaj a few days thereafter. 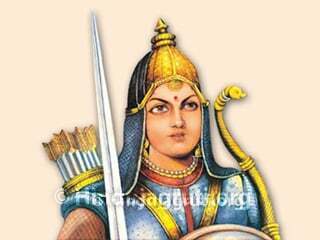 Rajaram was the child of Shivaji Maharaj & Soyarabai. 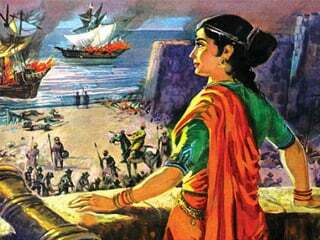 Soyarabai and her supporters plotted to arrest Sambhaji at the fort of Panhala, where he was staying at the time of Shivaji’s death. They wanted to crown Rajaram and not allow Sambhaji to become the Maratha emperor. However Sarnobat (the Supreme Commander of the Maratha forces) and Soyarabai’s brother, Hambirrao Mohite supported Sambhaji since he was the rightful heir to the throne. At the time of Shivaji’s death, there was news of an impending attack of Aurangzeb’s army on Maharashtra and at such a crucial juncture, a strong leader like Sambhaji was the need of the hour. Therefore Hambirrao did not support his own sister and sided instead with Sambhaji. Annaji Datto Sabnis and other courtiers namely Hiroji Bhosale (Farjad), Balaji Aavji and Rupaji Mane were arrested for supporting Soyarabai and were punished in a rather cruel way, by being killed when trampled upon by War-elephants. It was chiefly because of Hambirrao’s support that Sambhaji was able to ascend to his rightful place on the Maratha throne in 1681. The remarkable things that Sambhaji Maharaj achieved in his short life had far-reaching effects on the whole of India. Every Hindu should be grateful to him for that. He valiantly faced the 8 lakh strong army of Aurangzeb and defeated several Mughal chieftains in the battlefield forcing them to retreat. Because of this, Aurangzeb remained engaged in battles in Maharashtra, thus keeping the rest of India free from Aurangzeb’s tyranny for a long time. This can be considered as the greatest achievement of Sambhaji Maharaj. If Sambhaji Maharaj would have arrived at a settlement with Aurangzeb and accepted his proposal of being a tributary prince, then within the next 2 or 3 years Aurangzeb would have captured North India again. However, because of Sambhaji Maharaj and other Maratha ruler’s (Rajaram and Mahraani Tarabai) struggle, Aurangzeb was stuck in battles in South India for 27 years. 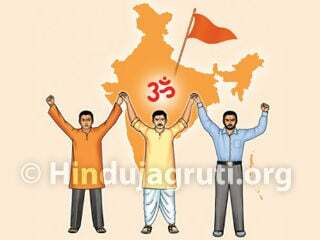 This helped in the establishment of new Hindu kingdoms in the provinces of Bundelkhand, Punjab and Rajasthan in North India; thus providing safety to the Hindu society there. It would be appropriate to examine the facile charge that Sambhaji lost his father’s kingdom to Aurangazeb. 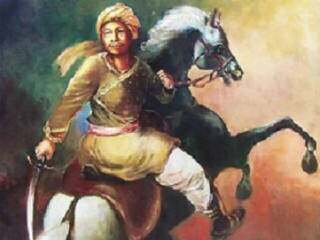 Let us see what was retained in Maratha hands and how much was lost to the enemy at the time of his cruel death. The details of the conflict as a whole, during Sambhaji’s reign, the progress, if any, of the Mughal armies and the gallant defense offered by the Marathas and their aggressive and retaliatory tactics help us to evaluate the efforts of Sambhaji and the Marathas to protect the gains of Shivaji. It also refutes the charge that Sambhaji had lost everything. The Mughals started their aggression in 1681 in Nasik-Baglan in the northern region of South Maharashtra. Till the year 1686, the Mughal forces had not succeeded in capturing any forts. Though the Mughal forces captured some forts during the last 2 years of Sambhaji’s reign, Aurangazeb was forced to resort to encouraging treachery. At the end of 1686, Salher fort was taken by the Mughals after bribing the Killedar Asoji with a mansab. Ramsej was also won by treachery in 1687. At the end of 1688 and the beginning of 1689, Mughals got Harishgad, Tringalwadi, Madangad, Mordant, Aundha and Karani by treachery. At the beginning of 1689, Matabarkhan captured Trimabkgad by offering cash and mansab to Shyamraj and Telangrao. Pattagad is an exception to this pattern. It was captured after a straight fight. In short it can be said that the Marathas were in command of almost all their territory till 1686 and in the end only the weapons of treachery and not arms proved effective against them. The Mughals turned to the central part of southern Maharashtra i.e. Talkonkan, Kalyan-Bhiwandi, Kothalagad, Pune and Satara region from 1681. Matabarkhan who had informed Aurangazeb about the difficulties in these regions, captured Kalyan-Bhiwandi, Purgadi and other other forts in Talkonkan only after the death of King Sambhaji. The Mughals however succeeded in capturing Kothalagad at the end of 1684. Fort Mahuli was captured by Matabarkhan on 21st Aug’1688 by giving a bribe of 2500 Ashrafis to Killedar Dwarkoji. In the middle of the year 1684, even though Aurangazeb succeeded in taking Surapur, Shirval and Supe, Sambhaji continued to hold all the important forts like Rohida, Purandar, Shrivardhan, Rajmachi, Sinhagad, Rajgad and Raigad. At the end of 1687, the Mughals were able to establish their hold on Satara, Parali,Nimb, Chandan, Vandan, Karad, Majgaon and Masar by Sept’1689. From 1689 , the Mughal posted their thanedar at Wai. In south Konkan, the Marathas held Sangameshwar, Rajapur, Panhala, Malkapur, Khelna, Pargad, Kopal, Bahaddurbanda, Shirole and Phonda till the end of Sambhaji’s reign. In Goa, the Mughals established their rule in Antraj Mahal only from Feb’1689. In North Konkan, the Marathas had retained their hold on Kulaba, Khanderi, Rajkot, Sagargad, Padmadurga and Cheul and the region around these places. In Karnataka, The Marathas lost Bengalore, Doddabalapur, Tumkur, Chikanhalli in the year 1687-1688 while they succeeded in retaining their hold on Jingee, Tanjore and territories surrounding these places. One thing can be said for certain that Aurangazeb who was not wholly successful, won a large part of the Maratha Kingdom immediately and only after Sambhaji’s death. The collective leadership under Chhatrapati Rajaram and Tarabai fought very gallantly so that the Mughal emperor could not achieve what he had vowed to do even after a long struggle of quarter of a century. He could never secure full control over the Maratha state. His resolve and ambition to become the master of the south soon after Shivaji’s death was foiled by Sambhaji and his successor Rajaram. Well known historian Sir Jadunath Sarkar and Vincent Smith have very aptly opined “If Napolean could say that it was the Spanish ulcer which ruined me, Aurangazeb could also say that the Deccan wars not only undid his own work, but also those of his predecessors”. No wonder Vincent Smith remarks that “the Deccan was not only the grave of his (Aurangazeb’s) body but also his empire”. It is well said that along with Aurangazeb’s person, his ambition to annihilate the Marathas was also buried deep in the Deccan. One may also add that the generation of brave patriots created by Shivaji held against the forces of Aurangazeb for Twenty Five years of agonising privations and against a vast and well equipped force. It can be said that world’s history records few, if any, struggles of such heroic grandeur and inspiring resistance, led by a young king, his still younger brother and a women. Herein lies the real success of the genius of Shivaji. Sambhaji Maharaj fought against the Portuguese in Goa who were very active in the forceful conversions of Hindus through various means like the ‘Inquisition’. He was very angry with them due to these conversions & the demolition of Hindu Temples in Goa. 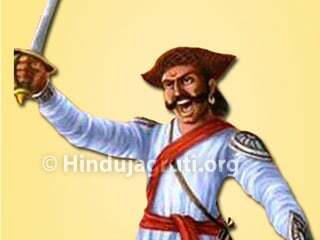 The Portuguese were very frightened of being assaulted by Sambhaji Maharaj, and this reflects in their letter to the British in which they wrote, ‘Now-a-days Sambhaji is the most powerful person and we have experienced it’. We all know that Shivaji Maharaj reconverted Netaji Palkar to Hinduism. 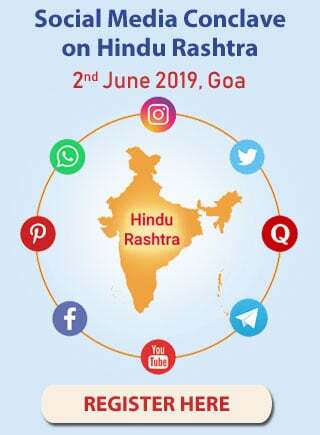 However, it is important to note that Sambhaji Maharaj had established a separate department in his province for the ‘reconversion ceremony’ of the Hindus who had earlier converted into other religions. 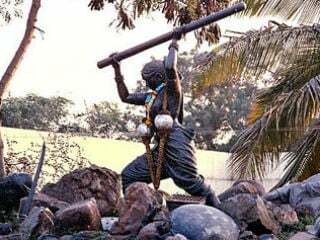 There is a story of a Brahmin named ‘Kulkarni’ of Harsul village in the history of Sambhaji Maharaj. Kulkarni had been forcibly converted to Islam by the Mughals. He tried to reconvert into Hinduism, but local Brahmins in his village did not pay any heed to him. In the end, Kulkarni met Sambhaji Maharaj and told him about his misery. 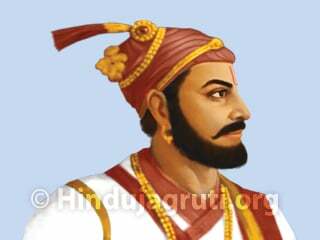 Sambhaji Maharaj immediately arranged for his reconversion ceremony and reconverted him into a Hindu.This noble initiative of Sambhaji Maharaj helped many converted Hindus to reconvert back into Hinduism. In early 1689, Sambhaji called his commanders for a strategic meeting at Sangameshwar in Konkan. In a meticulously planned operation, Ganoji Shirke (brother of Sambhaji’s wife Yesubai) and Aurangzeb’s commander, Mukarrab Khan attacked Sangameshwar when Sambhaji was about to leave the town. 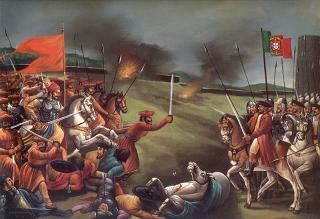 A small ambush followed and Sambhaji was captured by Mughal troops on 1 Feb, 1689. He and his advisor, Kavi Kalash were taken to Bahadurgad. Aurangzeb humiliated them by parading them wearing clown’s clothes. Later, Sambhaji and Kavi Kalash were tied upside down to camels with Mughal soldiers throwing stones, mud, and cow dung at them. When they were brought face to face with Aurangzeb, the latter offered to let Sambhaji live if he surrendered all the Maratha forts, turned over all his hidden treasures and disclosed the names of all the Mughal officers who had helped him. Sambhaji refused, and instead sang the praises of Mahadev (Lord Shiva). Aurangzeb ordered him and Kavi Kalash to be tortured to death. Sambhaji and Kavi Kalash were brutally tortured for over a fortnight. The torture involved plucking out their eyes and tongue and pulling out their nails. The later part involved removing their skin. On March 11, 1689, Sambhaji was finally killed, reportedly by tearing him apart from the front and back with ‘Wagh Nakhe’ (‘Tiger claws’, a kind of weapon), and was beheaded with an axe. This grievous death was given to him at Vadhu on the banks of the Bhima river, near Pune. After every torture, Aurangzeb would ask him if he had had enough and wanted to convert – but the courageous king kept refusing. By doing so he earned the title of Dharmaveer (Protector of Dharma) by which he is known to this day. Aurangzeb ordered for Sambhaji’s body to be cut into pieces and be thrown into the river. Residents of the nearby village named ‘Vadhu’ collected as many pieces of his body as they could find, sewed them together and performed the final rites on his body. These villagers later went on to use the surname ‘Shivle’ or ‘Shivale’, as per spelling preference, which means ‘sewing’ in the Marathi language. With Sambhaji’s death, the Maratha confederacy was thrown in disarray. 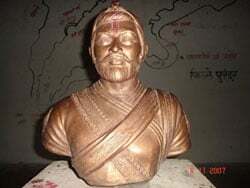 He was succeeded by his younger brother Rajaram who became the leader of the Marathas. The Commander in chief of the Maratha army, Mhaloji Ghorpade, who succeeded Hambirrao Mohite, died in the ambush at Sangameshwar. 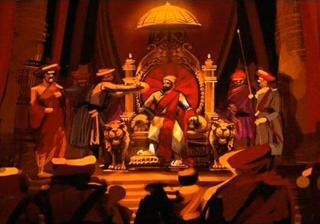 A few days after Sambhaji’s death, the capital Raigad fell to the Mughals and Sambhaji’s wife and son were captured. However, Sambhaji’s torture and heroic death unleashed an unprecedented unity and heroic spirit amongst the Marathas. Aurangzeb continued his grim war against the Marathas for another 18 years but could not subjugate the Maratha state. 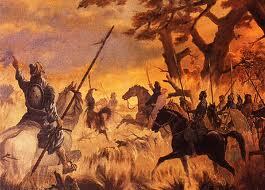 Aurangzeb spent the last 25 years of his life in the Deccan, in constant warfare to vanquish the Marathas. He died in 1707, at Ahmednagar, Maharashtra. In 1737, within 50 years of the torture and death of Sambhaji, the Maratha – Jat Allied armies entered Delhi and re-established Hindu rule over all of western, central and much of northern India. It was the first time after 1192, when Prithviraj Chauhan was defeated by Mohammed Ghori, that a Hindu army was in control of Delhi except for a brief period by Hemu in 1556. The Maratha Empire would remain the foremost military power in India till they lost power to the British after 3 Anglo-Maratha wars, the last of which ended in 1818. There is some dispute amongst historians about Sambhaji’s ability as a ruler. These disputes came mainly from British & Mughal historians like Khafikhan & Grand Duff. These historians have portrayed him as ineffective and an alcoholic. Other historians, notably S.G. Shevde, portrayed Sambhaji as a capable ruler. However many historians like Babasaheb Purandare, Shivaji Savant have revealed the truth about him to society. Read about Gudi Padwa, Significance of Gudi Padwa, Science in the worship of the Gudi, Method of raising the Gudi, Celebration of Gudi Padva Festival.